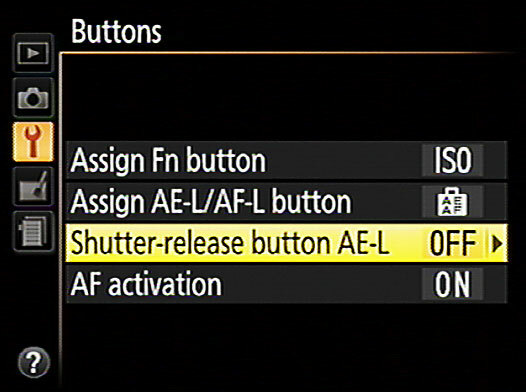 Shutter-release Button AE-L: This option determines whether pressing the shutter button halfway locks focus only or locks both focus and exposure. (AE-L stands for autoexposure lock.) At the default setting, Off, you lock focus only when you press the shutter button halfway. Exposure is adjusted continually up to the time you take the shot. If you change setting to On, your half-press of the shutter button locks both focus and exposure. AF Activation: At the default setting, On, pressing the shutter button halfway initiates autofocusing. If you change the setting to Off, pressing the shutter button halfway fires up the autoexposure system only. The final two settings on the Buttons option list affect the shutter button’s role in setting focus and exposure.